We fell in love with Mandeville, when we moved here in 2007. We recently bought our “forever home,” and I’m OK if my next stop is the St. Tammany morgue. I can be seen walking my dogs down to Sunset Point each day. You also might spot me running, cycling or kayaking around the lakefront, the trace or bayous. We have wonderful schools, shopping and restaurants, offering an easy commute to New Orleans. I’ll let you in on a little secret, I don’t mind sharing my space, but I don’t want the huge “New Urbanism Port Marigny Microcity” in my backyard! Yep – I’ve become a NIMBY (not in my backyard). And to tell you the truth, I was completely open to the idea of this development when this process began. Now – AGAINST!!! “High Density New Urbanism” does not fit into our community’s vision and our existing landscape. Common sense needs to prevail here! Sales pitches as to how this will hardly add cars to our roads or negatively impact the closest local school, RIDICULOUS! This week, my Mandeville neighbors finally had a large block of window to speak at the Planning and Zoning meeting. One woman got up and stated that she was originally for the project, but NOT in favor of what has been presented. Many others echoed the sentiment that they were NOT for something this DENSE!!! Like I said in my previous post, this is 10 pounds of peanuts in a 5 pound bag! 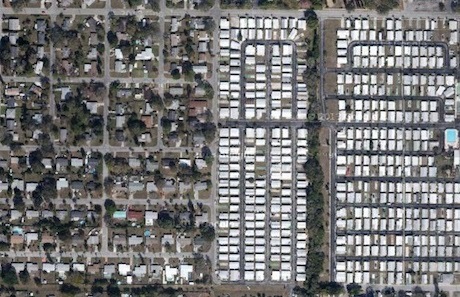 Look at the picture below, this is of a trailer park next to a residential community. It is not too far off the scaling of this proposed Microcity in the middle of Mandeville. Being able to borrow a cup of sugar from your window by reaching into your neighbor’s, is about the scale of many of these units. How does that fit into our current landscape? How can we be told that these people won’t have the need to drive, when ALL of us, get in the car all day long to go to the gym, store, place of worship etc… If I go to a vacation destination “New Urbanism” community, I may not drive very much when I’m on vacation on the beach (Seaside, Rosemary Beach). MANDEVILLE is NOT a vacation destination! This type of community will not represent the normal Old Mandeville or Mandeville growth, where a house is added here or there on a an undeveloped lot. The solution – the City politicians needs to not feel the need to rush to pass this through without examining every angle. Listen to hired independent experts, request additional experts if you don’t have all the answers you need to make the best decision for your constituents (your neighbors), whatever it takes to do it correctly! Vote NO at this current density. And if asked what would make me happy, at least 50% less dwellings, no apartments (condos instead) and dramatically reduced retail space. *** Picture of trailer park taken from here. Picture at top of page, taken from here. As a Mandeville resident since 2003, I agree with you completely. I’m not against development so long as it compliments the quality of life Mandeville is known for. This density would compound our existing infrastructure issues – namely, traffic. Thank you for speaking out! What are the numbers for Mariner’s Village and Magnolia Ridge? They might provide more insight than random a trailer park . You are welcome to research that. It seems houses in Magnolia are built on quarter acre lots. 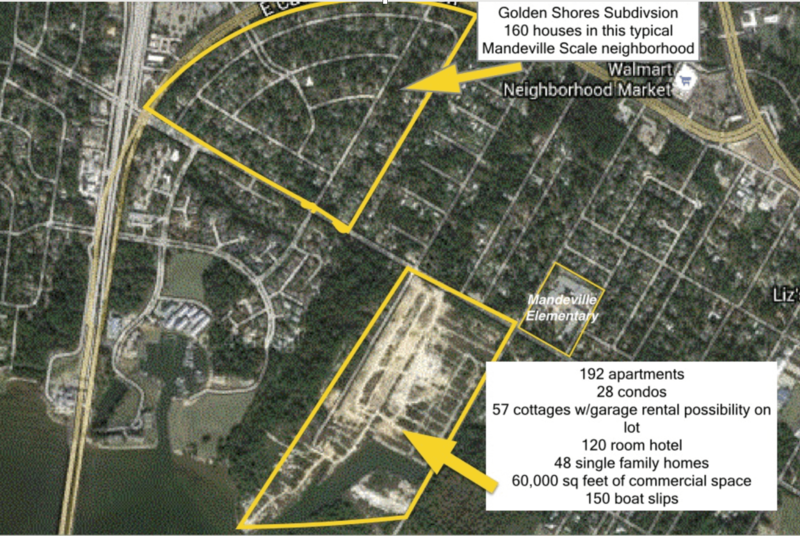 If Port Marigny had the same density, 292 homes could exist.